Science House, the home of NYU Sydney. Photo credit: Daniel Boud. Stepping through NYU Sydney’s welcoming stonework entrance, visitors are immediately struck with a sense of history. Built in 1931, the site retains strong physical evidence of a long association with groups that once occupied the Heritage-protected building. 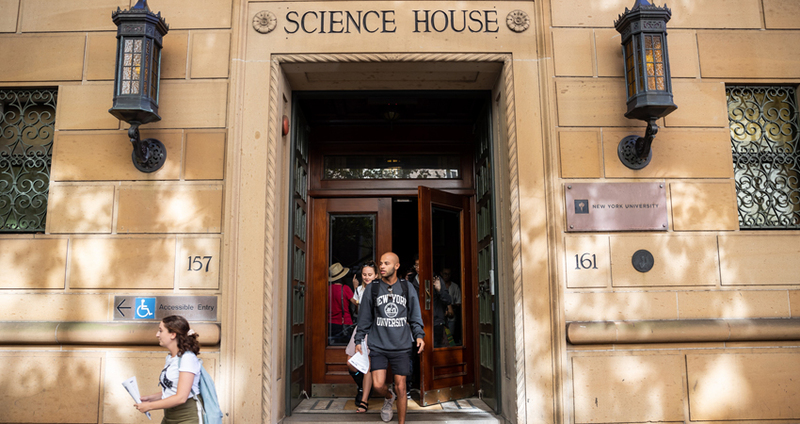 Science House has been host to Australia’s leading scientific organizations such as: The Linnean Society; The Royal Society of New South Wales; and The Institution of Engineers Australia. NYU, which has occupied the site since 2012, has tasked itself with continuing the rich tradition of academic inquiry. The building’s catalogue of photography showcasing scientists from the 1930s reminds visitors that this is a place steeped in academic rigor and tradition. But as you traverse deeper between teaching environments, with their vibrant canvases showcasing friendly faces of semesters past, it soon becomes apparent that the site maintains an exciting amalgam of past and present. Sydney has long been renowned as a city for start-ups, innovation, technology, and education. NYU Sydney appear to have struck the perfect balance for respecting traditions while embracing the future for their learning objectives. It is this balancing act, along with the energetic administrative and academic staff, that makes the site so attractive to students. It is here that a respect for tradition meets a new wave of tech-savvy students instigating their own international academic journey. The site’s staff are now tasked with meeting changing expectations of learning styles and communicating the site’s story as it continues to grow. 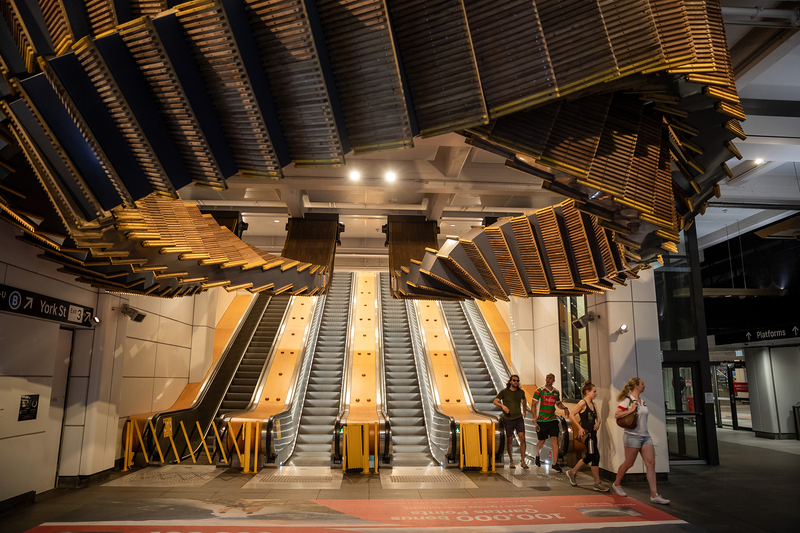 In the five years that NYU Sydney has been welcoming students, local staff have crafted a unique learning environment. As student numbers continue to increase for the Sydney site, so too does experimentation with new projects and mediums tasked with enhancing learning experiences. Each classroom is host to an impressive AV cart inclusive of elements such as a large-screen TV and Mac Mini, and Apple TVs, which allow students to cast supplementary materials onto the large screen for all to see during discussions. With the use of Google Drive, real-time simultaneous edits and contributions can be made to planning documents and learning materials. This base technology allows for a truly interactive, communal learning environment. 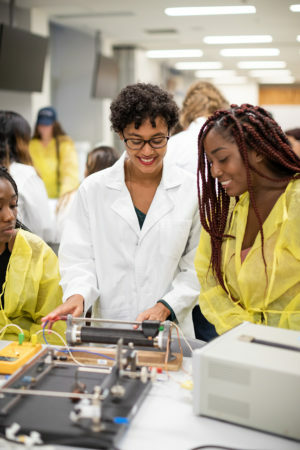 Off site, science students also have access to world-class laboratories, thanks to the site’s partnership with a local institution which is host to Australia’s first ever “Super Lab.” Sydney is one of a select group of global sites offering sciences in the spring and fall semesters, and these state-of-the-art teaching facilities are now host to physics, biology, biochemistry, and chemistry lessons. Instructing sciences in these locations allows interaction with local students and experts, with the learning environment less than a five-minute walk from student housing. Opportunities for experiential learning are an integral element of the Sydney experience. Students stay in Sydney for roughly 17 weeks, meaning any opportunity to broaden understandings of concepts in local contexts is essential. 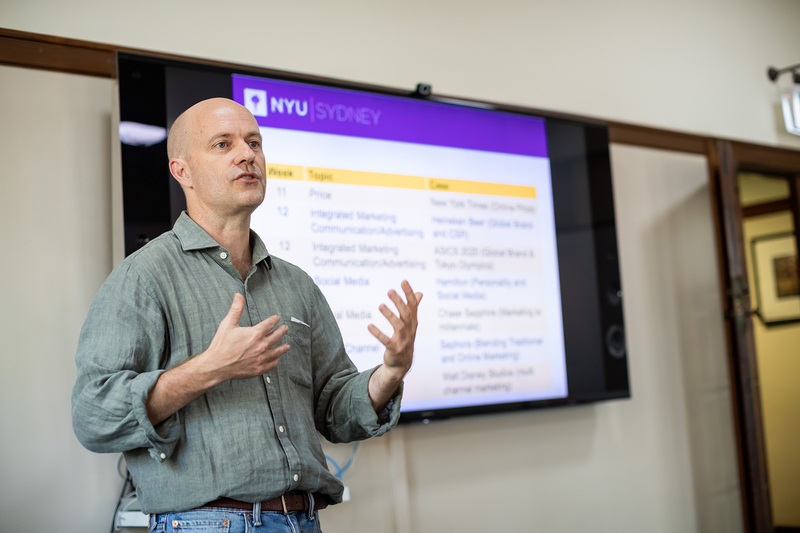 Accordingly, the curriculum at NYU Sydney has extended the reach of learning technologies beyond the classroom. A field trip to the Sydney Opera House. Photo credit: Daniel Boud. NYU Sydney uses a wireless audio headset system, enabling local instructors and guest speakers to speak to students within a 250 meter range, affording students enhanced freedom to independently explore aspects of a location or collection without missing important discourse. Inside the classroom, the team has begun experimentation with virtual reality as a teaching tool, enabling students to put themselves into another environment and be rewarded with a real feel for the location and atmosphere. Collisions is “a virtual reality journey to the land of indigenous elder Nyarri Morgan and the Martu tribe existing in the remote deserts of Western Australia.”1 Commissioned by the New Frontier program at the Sundance Institute, the work features 360-degree panoramic photography, computer animation, and an ultra-dynamic soundscape created using Dolby Atmos. The Collisions screening is one example of the possibilities that VR technology affords to the learning environment: being able to transport a whole classroom to the desert to create their own learning experience with uniquely Australian content. Wynyard Train Station in Sydney. Photo credit: Daniel Boud. Since opening in 2012, NYU Sydney has welcomed almost 1500 students. With social media followers increasingly mirroring these numbers, the Sydney site — now more than five years into operation — has over 1000 unique stories. The team at NYU Sydney work hard to ensure experiences, both academic and communal, remain with students as they leave for the next stages of their academic and professional careers. Part of this story is keeping lines of communication open and building on each story to create a rich tapestry. To function as a research pathway to understand how online platforms affect students, both before and after their time in Sydney. NYU Sydney students in the Physics Lab. Photo credit: Daniel Boud. 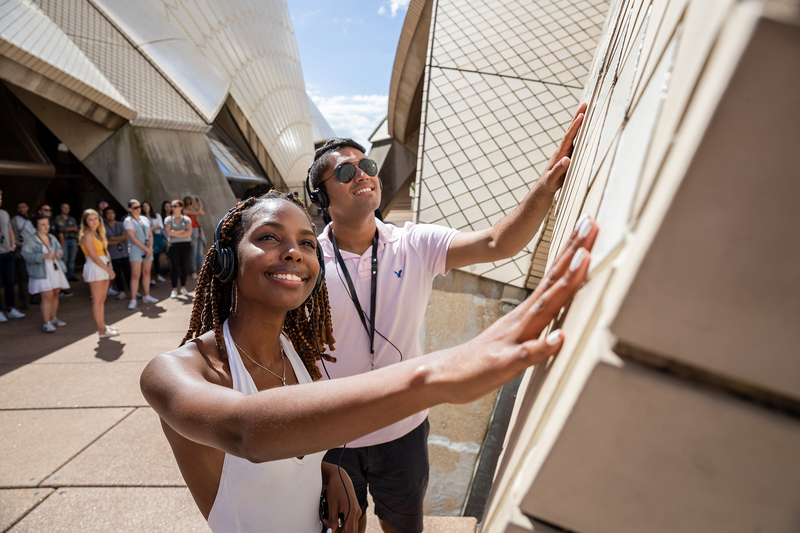 NYU Sydney is also preparing the release of an interactive platform offering 360-degree tours, interactive maps with pop-up video content, and much more, all as part of a push to increase access for anyone wanting to learn more about the site and city in which it’s located. There is also a newsletter, both physical and electronic, for and about NYU Sydney that will be launching soon.